Hey guys, we have another delayed opening this morning due to the snow yesterday evening. Crazy stuff. I hate when I get up and start to get ready, only to find out at 5 o’clock AM that school is delayed…ugh! But at least it gives me some extra time to blog and…just breath! Anyway, did you catch the opening ceremonies on Friday night? I started watching around 8:30 when all the athletes were coming in and then watching until 10ish. But I have to say, I was not impressed by the opening show. It was nothing special and nothing like 2012. What did you think? I did catch a few more events over the weekend, but nothing was to spectacular yet. Plus I think the summer Olympics are so much better and interesting. Gymnastics, weight lifting, swimming, diving, you know, the cool stuff. Yea, the winter games have figure skating, the ski jump, and skeleton (pretty cool), but it just isn’t the same. With that being said, I am still fully routing on Team USA! You know I love our inspiring athletes no matter what sport they do 🙂 Anyone who dedicates that much training, hard work, and love to their sport is awesome in my book. 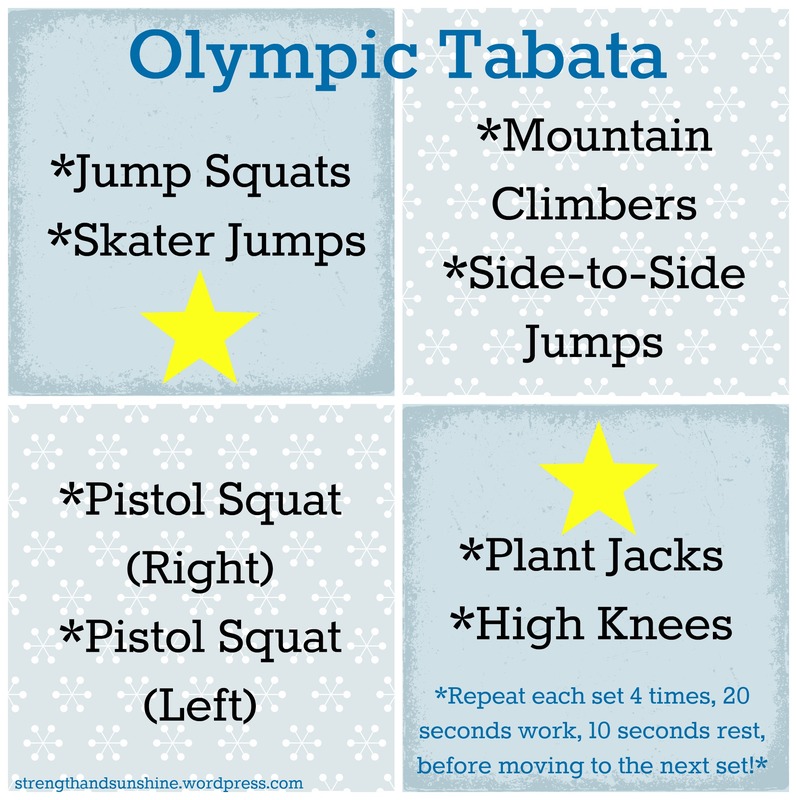 I put together a fun quick tabata for you today. All the moves were inspired by this little infograph of Olympic-inspired bodyweight exercises. Perfect bodyweight moves to get you heart pumping and your muscles working. 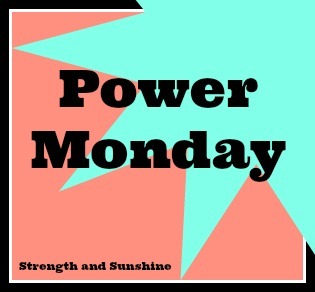 Do this while your watching the Olympics and feel the power, strength, and feel good endorphins those athletes feel! + Form Ques: Jump Squat, Skater Jumps, Mountain Climbers, Side-to-Side Jumps, Pistol Squats, Plant Jacks, High Knees. + Complete each 2 exercise set 4 times though. Do each move for 20 seconds then rest for 10 before you do the next exercise. That would be one set. Total time will be 16 minutes and you will get a great full body cardio blast! + I am not a fitness professional. Remember to listen to your body and keep it safe, know your limits, but challenge yourself too! Wouldn’t it be amazing to be in the Olympics and compete. I love the thrill of competing every since I was a competitive dancer and state champion baton twirlier. Those moments of before you go out to perform the nervous the crazy “I can’t think or remember my routine”, but then once you get out there somehow you pull through and feels like it is over in 5 seconds. Then you step off the stage/floor and don’t remember a thing about your performance, only that you somehow did it and now you have this overwhelming post adrenaline feelings. I always cried when I finished performing, that was the only way for my body to release all the tension and breathe. But I absolutely loved the feeling. There is nothing that compares (that is what I miss most from my days as a competitive athlete). And performing in a huge stadium like Madison Square Garden…during half-time…I can’t even begin to tell you what that felt like. I am grateful that I was able to experience that feeling so many times and will always cherish it (the one positive from my former career). What is your favorite Winter Olympic Event to watch? The ski jump! It is so damn cool…and so damn scary, haha! Where do you get your adrenaline rush? My husband and I are OBESSED with the winter olympics! I love watching almost everything because it’s so crazy how fast they are in the snow. Our favorite is always hockey, but my husband also loves ski jumping and curling and I’m getting into that crazy sport where you have to ski and then shoot targets! I’ve spent some time shooting guns and I can’t imagine having to shoot and then ski around – you would be so tired I have no idea how you could even aim! Haha I think that is the biathlon! You know what else is kind of cool though? Skeleton and bobsleigh! I haven’t been into the Olympics this year for some reason. I usually love the skating competitions, but my husband commented last night that he was surprised I hadn’t been watching it. Neat routine thanks for sharing it! It just doesn’t feel like an Olympic season this time. I didn’t even know we were having them until a month or two ago!